The last sixteen of the Valladolid Open 2018 got underway at the Plaza Mayor de Valladolid with four pairings making their way to the quarter finals. 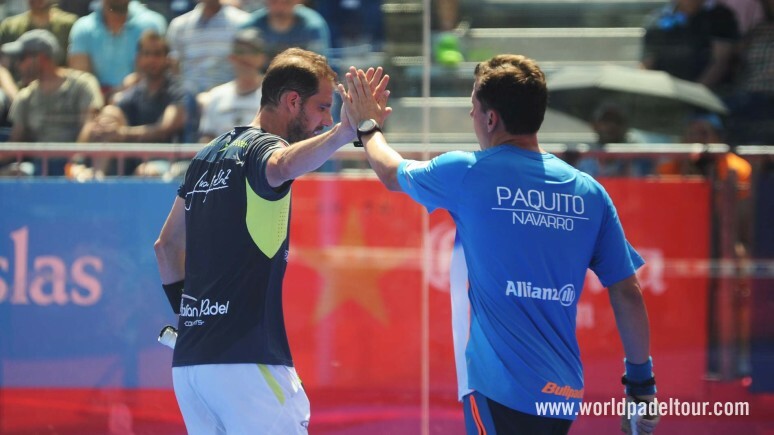 The first match on centre court at the Valladolid Open 2018 brought together two spectacular pairings. Álvaro Cepero - Godo Díaz vs Lucho Capra - Ramiro Moyano. A break in the eighth game was enough for the Argentines to win the first set 6-3. They were even more convincing in the second set, which they won 6-1 to reach the quarter finals for the second consecutive tournament (the third time this season). This match started with an early break for Piñeiro and Lahoz which Lebrón and Belluati recovered from to roce a tiebreak and win 7-6. The second set was just as tight and also went the distance, this time with Piñeiro and Lahoz winning 7-6. The match ended up going to Lebron and Belluati with a 6-4 scoreline in the third set. This match had more ups and downs than was perhaps predicted. Diego Ramos and Rafa Mendez broke Paquito and Juan Martin to control the first set, which they won 6-4. Paquito and Juan Martin had their backs against the wall in the second set, which they claimed right at the death 7-6. And in the third match, again it was a tiebreak which would decide the victor. Paquito Navarro and Juan Martin Diaz survived and live to fight another day. The first session ended on centre court with Víctor Ruiz - José Rico vs Alejandro Galán - Matías Díaz. Mariano Amat's players took the first set 6-4. The start of the second set was a carbon copy of the first, with Diaz and Galan controlling and going 5-4 up on serve. They closed out the match with their serve to win 6-4 in an hour and 35 minutes.